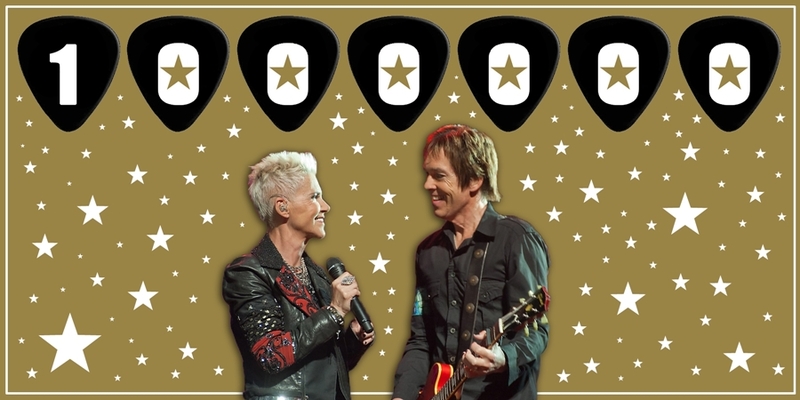 If you are a Roxer and enjoy everything what all the social media platforms bring you related to our beloved band, you can’t miss following Roxette’s official Instagram profile. Their account is @realroxette and went live on 13th February with sharing the It Must Have Been Love single sleeve with this text and hashtag: ”Finally! We have an Instagram. Remember this? #ItMustHaveBeenLove”. The second pic has been posted today. 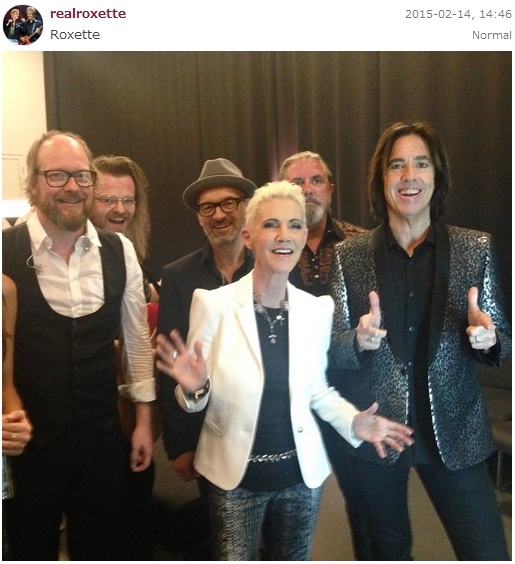 We could see a lovely shot on Roxette’s Facebook page from before the show, from the band’s dressing room in Perth, but you’ll see a different angle on Instagram. With love from Perth. So far, the #ItMustHaveBeenLove hashtag seems to be very popular, however, for collecting more followers adding the hashtag #Roxette would be quite helpful. How active this account will be we don’t know. If it is also run by our favourite oPERator, we don’t know either, but we wouldn’t be surprised if it’s him handling that profile, the social media guru he is. Either way, start following them there, too if you already have an Instagram account. If you don’t own a profile yet, maybe it’s time to create one. No, we won’t do a flashmob every month, BUT Roxette Official reaching 1 million likes on Facebook is definitely something we had to celebrate. Many of us were thinking about this magic number since long, but then Kathie Winn came up with the question if we would really do something. Then we had to speed up, as the page was getting 2000-5000 likes per day. But what should be the BIG idea? Well, when you’re stuck, besides talking to yourself, it’s always good to go back to the roots. This time to Neverending Love. Is there another phrase that could express our feelings towards Roxette any better? Not really. More than that, there is a perfect line – You’re 1 in a million, we’re 2 of a kind – which Alexandra Neitzel ”translated” into something more fitting for this occasion – I’m 1 in a million, you’re 2 of a kind. Then Basia Konarzewska came up with the idea to take pics of ourselves holding a sign that says this line. An event was created on Facebook, just like the last time when we had the poster flashmob and many Roxers joined from around the world. We all started thinking about our own photos, how creative they should be, if we should visit the gym before we take the pics or go to the hairdresser, but as I said before, the number of likes on the page was speeding up, so there was not much time left. SUNDAY UPDATE #5: Aaaarrgghhh, missed the magic moment. This is what I got. Did you catch the million mark on photo? /P. Thanks Alexandra and everybody else for making this happen! Splendido! Cheers! So, Per, could you tell us your alias you use in our closed fan groups? 😉 Funny that he posted exactly that pic with this comment. How else could it be if not because of him being a secret member of our groups? Haha. 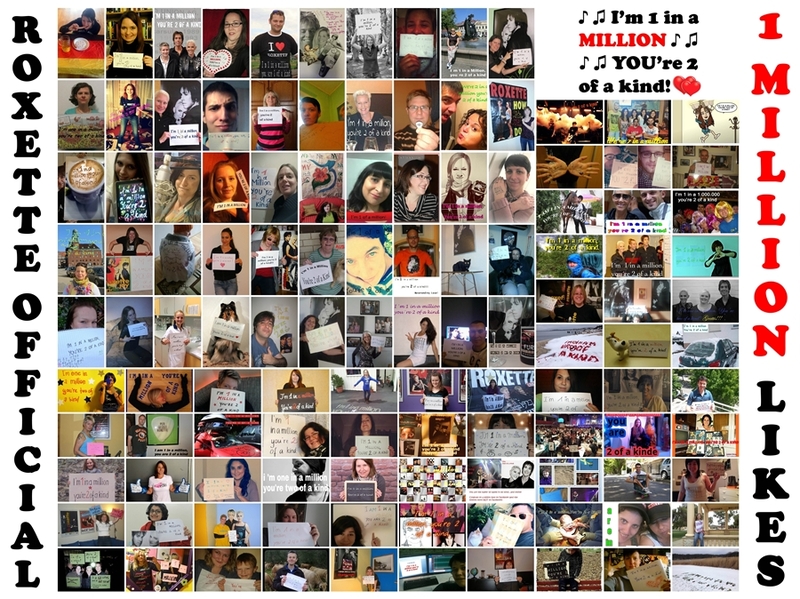 THANKS EVERYONE FOR YOUR FAB PICS RE THE MILLION MARK ON FACEBOOK! VERY NICE INDEED! /P. We are incredibly glad you’ve been there with us waiting, Mr G. You deserved all the remaining Breaking Bad episodes for this. CONGRATS & keep up the good work on Roxette Official! Here is a collage of all the 118 photos. You can download it in hi res from HERE. 2 great videos have been made to keep this flashmob in our memories forever. The first one is made by Doogsyify Winn, Kathie’s handy daughter and the 2nd is by another talented video-maker Roxer, Michi Seeber. Thanx for your work with them and sharing them with us! TheWorldsMostSuccessfulPowerPopDuoSupportedWithLoveByTheBestFansOnThePlanet reached 1 million likes on Facebook! The page went live on 9th December 2010, so 3 years and 2 months ago. Thanx to this, we got even closer to Roxette and Roxette got closer to us than ever before. Daily posts, info, news, huge amount of pictures, loads of short videos, some re-re-repostings, great songs of the day, meaningful questions to us, answers to lots of our Qs, comments on many of our posts or comments = pure fun for our hungry Roxer souls! One could say: but hey, there are bands and artists with much more likes on their Facebook page, so why is that such a big deal? I would say this 1 million is a fantastic and well-deserved result of a constant, top level ”thinking from the fans point of view” job, which is much appreciated by all of us. I think I can talk for tons of Roxers: it’s better being 1 in a million and having Mr G himself operating the site than being 1 in tens of millions without his jolly updates. So, open the champagne and let’s celebrate! Congrats for the great achievement to the World’s Very Best oPERator and his Magical PowerPopDuo Partner, as well as to the wider Rox Family! Keep up the good thing and keep the Admin! Hey, it’s you out there that made it happen! /P.